Your bed is supposed to be your personal escape from the frantic stresses of modern life. Nothing says “unwind,” after all, like laying back and feeling the knots in your shoulders and your mind loosen as you doze off. But each set of tired limbs aches in its own way, and the mattress type that offers the most relief varies from person to person. Kingsdown, a North Carolina-based mattress company, is one of several firms that have turned to technology to help customers find the perfect bedtime fit. In Kingsdown’s case, that technology takes the form of bedMATCH, an innovative, computer-based system that recommends specific mattresses based on a buyer’s physical attributes and sleeping preferences. The magic of bedMATCH lies in its user-friendliness: the system boasts of performing over 1,000 calculations to arrive at its recommendations, but shoppers never have to share in any of that work. Instead, people just need to answer some questions and spend a few minutes laying on a test bed to get their results. While seeking comfort remains a largely subjective affair, bedMATCH’s scientific approach helps cut down search time by culling the vast and varied field of available options. The bedMATCH system views comfort and relief as a function of good postural support, so it measures factors such as the customer’s weight distribution, lumbar curvature, height, and weight. BedMATCH then compiles these into a comprehensive sleeping profile, which serves as the basis for a shortlist of around 6-7 suggested mattress models. Recommendations depend on each showroom’s inventory, so customers will always be able to test the suggested models firsthand before making a final decision. The same holds true even for people who answer the bedMATCH questionnaire online, sans the test bed: the system still asks about factors like age, height, weight, and chronic tension spots. Online users then receive a color-coded printout, which they can bring to a brick-and-mortar store to receive personalized shortlist of models to try. All of that’s in sharp contrast to the typical mattress-buying experience, which often veers into the frustrating and arcane. Even returning customers who are well past the first-time-buyer stage can still end up confounded by the industry-specific qualities, materials, and considerations that factor into a purchase. With the plethora of options, many of which come at vastly different price points for opaque reasons, would-be buyers often end up spending hours on research. Add to that the findings, from the Better Sleep Council, that many sales associates tend to focus on technical details rather than each mattress’ sleep and health benefits, and finding the right mattress for improving your sleep can feel almost impossible. As TIME Magazine has noted, the whole process of buying a mattress counts as one of the most painful shopping experiences for consumers. Equally painful, if not more so: the process of returning an unsatisfactory mattress. People who end up unhappy with their purchase normally have a tedious road ahead of them—if they even have the option to return their mattress at all. The Wall Street Journal has reported that many big-ticket mattress sellers deliberately make the returns process as convoluted and taxing as possible, whether through tons of paperwork, circular process, or exorbitant fees. When it comes to local stores, the same report found that many forbade mattress returns altogether. Meanwhile, online mattress businesses, which try to set themselves apart by offering deals like lengthy return periods or services like free shipping and processing for returns, still operate on the expectation that most customers will decide against returning a mattress, even if they don’t like the product. The mattress industry’s aversions to returns can be chalked up to their hefty additions to company expenses. Facilitating returns—from transporting products back from customers to processing the returned items—can be a time-consuming and resource-intensive task, not to mention an unprofitable one, since mattresses can’t usually be resold. But that also leaves unsatisfied customers in an unpleasant hole, especially since, as the Better Sleep Council reports, average mattress prices have jumped from $498 to $929 for a quality model. More distressing still, even the financial blow of a bum mattress pales in comparison to the toll an ill-fitting mattress can take on your health. Ergonomics research by a University of Oklahoma team have proven strong links among chronic pain, sleep quality, and mattress quality. Sticking with an old or unsuitable bed, they’ve found, can prolong chronic physical discomforts. All of this to say that selecting the right mattress can be quite the monumental decision, and new systems like bedMATCH can help consumers avoid costly missteps. No wonder, then, that Kingsdown has earned accolades over the years. Much of the company’s success so far has stemmed from bedMATCH’s compelling demonstration of how technology can successfully update business practices and enhance buyers’ experiences. Those improvements aren’t limited to the company’s own products or customer services, either. The bedMATCH system is described as “brand agnostic,” and different mattress retailers all over the United States use the system. Kingsdown has even extended its bedMATCH deployments to Asia, starting with a South Korean showroom opened in partnership with local manufacturer Navijam and mattress retailer Rentus in 2016. Kingsdown’s plan also included sixty more bedMATCH-equipped showrooms all over Asia in 2016, a goal that the company recently smashed with its 100th store in China alone. In fact, bedMATCH has been so widely used that Kingsdown reported having around 11 million bedMATCH customer profiles by 2017, just six years after the system’s debut. Today, Kingsdown continues to keep bedMATCH on the cutting edge by incorporating 3D technology for more precise profiles and recommendations. The latest version of the bedMATCH system generates 360-degree images and high-definition avatars for better mattress support simulation. 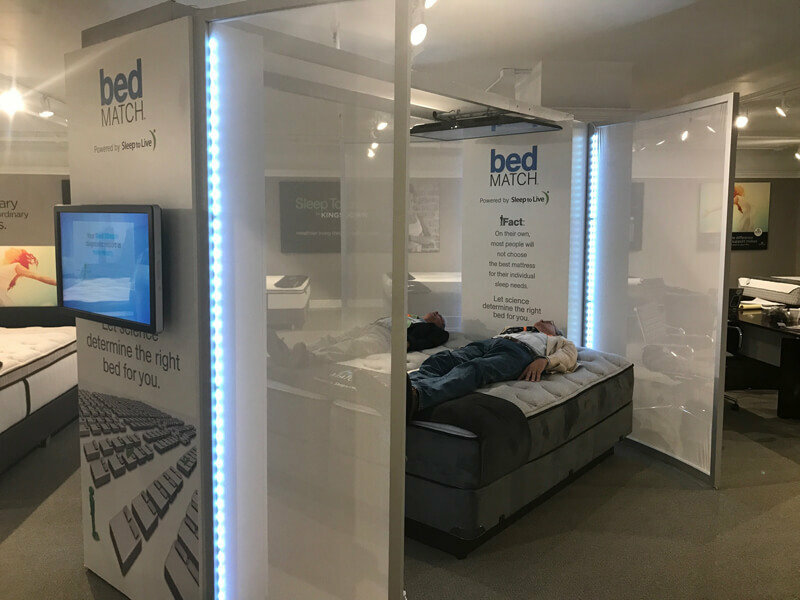 Sleeker showroom pods and customer-facing screens will also give consumers a better look at the bedMATCH system’s diagnostic process.